Summer time conditions are now with us. What a difference in QRN levels from last month. None the less, a lot of good readings. Thanks to all who particpated. N8OB OH EN80ko Bands were noisy but signals were good. Fun as usual. W0PHD MN EN18oe Heavy QRN and QSB with large frequency swings but at least I could hear the stations. N2GL OR CN85ko Mixed HP3335A with unknown at rx input and measured 300 Hz beat compared to harmonic of 60 Hz line. Hope I picked the right sideband this time! WA1ABI RI FN41jp Condx not the best with lots of QRN, but heard all runs OK. Thanks Connie and Marvin, 73 to all. AB4RS VA FM18hw Trimble Thunderbolt drives HP-3336C. Injected known reference frequency, tuned using Yaesu FT-897d. Used Spectrum Lab to sample AF and determine difference between reference and test signal. K5CM strong on both 40 and 80m. W6OQI strong on 40 m, 80 m was weak, but Spectrum Lab pulled it out of the noise. KØMZ KS EM28ix Thanks Connie and Marvin for another FMTest. I measured all frequencies with a Heath counter driven with an HP 10544A oscillator. I tuned the transfer oscillator to the signal strictly by ear. Both of Connie's 80 and 40 meter signals were about 40 over solid. I used the Atlas 210X for the 40 meter sig and a Heath HW-8 for the 80 meter sig. Marvin's 40 meter sig was about S-9 or more and the signal had about +/- 1 Hz doppler or so (by ear). The 80 meter signal was about S-3 or so with a lot of QRN. I used the Heath HW-8 for both 40 and 80. The HW-8 seemed to be a little easier to hear and tune the matched tones than the Atlas. K1GGI EMA FN41 QRN was fierce with hardly any letup, severe storms in western New England. W6OQI on 80 was pretty well buried as far as copy by ear goes, but SL peaks were usable. Tnx for another one guys. WA2DVU SNJ FM29nc No QRM on 40 or 80 tonight. 80 had a bunch of QRN as a storm was a few hundred miles away. Doppler was not too bad for a change. AA8K MI EN82sx Peak signal levels received in dBm: K5CM 40M -57, K5CM 80M -78, W6OQI 40M -72, W6OQI 80M -103, WWV (between K5CM 40M and 80M transmission) 2.5 -80, 5 -58, 10 -55, 15 -69, 20 -98. Antenna: ground-mounted vertical 20 meters high. 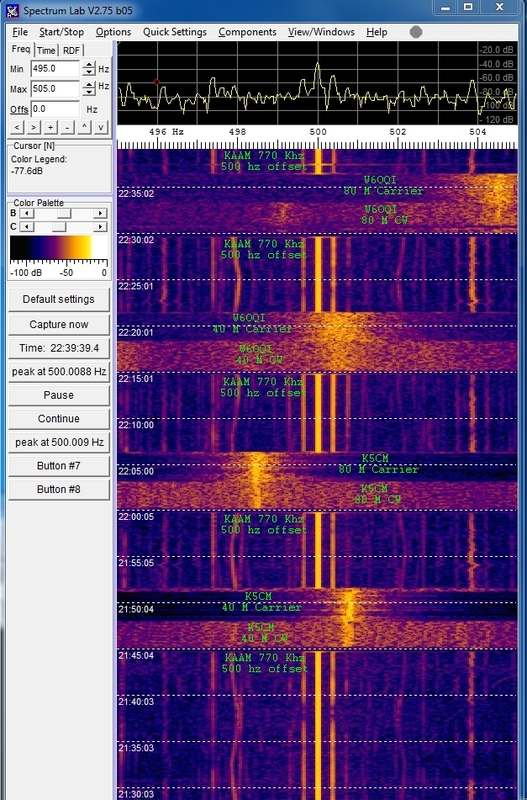 I used only Open HPSDR, Thunderbolt GPSDO, and Spectrum Lab. I offset HPSDR about 500 Hz to make an tone with its BFO, used PowerSDR to make a wave file. 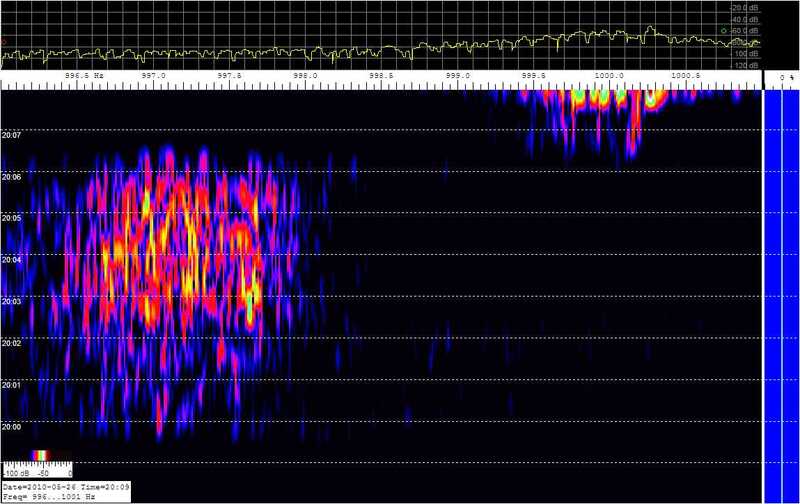 Play the wave file back and run Spectrum Lab, note the offset from the HPSDR frequency. W2FD WPA EN91 Noisy conditions on both bands. Signals fairly strong except for very weak signal from W6OQI on 80 meters. Thanks to both of you for running the FMT tests. K5XL NTX EM12kp First attempt at K5CM FMT. Terrible Doppler, decent sigs. Equipment:FT-1000MP/TCXO4 calib to local GPSDO AMstations, computer soundcard calib to WWV 500 hz tone, SpectrumLab. Kept room temp at 80 degrees during test. Equipment was within about 10 ppBillion as best I could determine. :-) Thanks for the FMT! W1PW AZ DM33 Method: FT-817nd calibrated with Thunderbolt DGPS; tone into SL; SL data saved to txtfile. Spreadsheet averages the SL readings and makes calibration corrections. LOTS of Doppler on K5CM 40M, Much less on 80M. W6OQI was 459 on 40M and 599 on 80M. Thanks Connie and Marv for yet another FMT! N5DM STX el29fs TS-480S and DigiPan v2.0. Some Doppler on all signals. W6OQI 80m signals below QRN (S9) level in STX. VE2IQ ON FN15nt Heavy QRN, Marvin's 80-M run quite weak. Method this time was to average 100 readings weighted by amplitude. More fun trying new ideas with fresh data. Thanks for the sigs. K6APW/7 OR CN93eq Siganls good, but 40M seemed quite unstable. Measurement granularity 10Hz before guess and by-golly interpolation and calibration correction. Fun, and thanks to Connie and Marvin. W9TJ IL EM48 Signals from Connie were excellent 9+20 both bands with some short quick fades on 80. West coast 40 was S9 QRN at S9 and QSB while had to dig on 80 with sigs S5 to S7 QRN peaks at S9+10. Doppler was wild even on 5 mhz and 60 khz. Entire session using SpecA and it had it's work cut out on WC 80. My thanks again to all who made the test possible. N3FG EPA FM29 W6OQI 80M sig. vy weak. I took a stab at it anyway Hi.Used an IC-7200 w/dipole and Spectran. Thanks again. I always enjoy it. WB3AKD VA FM19cc K5CM on 40M was strong with some doppler. K5CM on 80 a bit weaker than 40 but less doppler. W6OQI on 40 was clear and pretty easy copy but fair amount of doppler. W6OQI on 80 was a real bear to copy as the signal was weak, and fading. Still, I think I got a decent reading on 80. My setup is about as good as it is going to get until I lay out a better antenna. Many thanks it is always enjoyable. K5BTK MS EM42 The K5CM 40m signal was great! The others were pretty weak. The W6OQI 80m signal was barely visible on the waterfall - so weak that the standard deviation on multiple measurements was 30X as large as the other three. Incidentally, my measurements generally show significant uncertainty at the 0.1 hz level (usually giving a standard deviation of +/- .3 to .4 hz). So when I enter FMT measurements to one milliherz, it's just making the best guess at the number of "beans in the jar". I shudder when I enter the digits beyond 0.1 hz. Thanks! AF9A IN EM69wv Big signals on both bands, S9++ Thanks! W4UK SC EM93an Both stations weak here in SC. KD2BD NNJ FN20xd 80-meter signals were not nearly as strong as during last month's FMT. W6OQI reception was difficult due to weak signals and QRN from t-storms in New England. The Kp-index was 2 and decreasing, and fading was not severe. W3JW VA FM17tn Signals were good this time around except for Marvin's 80 meter signal which was quite weak on the East Coast (suspect that's just the time of the year!). All signals exhibited major doppler spread which is about par for the course on 80 and 40 M. Tnx fer gud Memorial Day FMT! k6bzz AZ DM33xb Good 40 meter sigs from both stations, weak on 80 both stations. Thanks for running the test. Always fun. WB0LXZ KS EM27pk I hope I am learning to use Spectrum Lab. HP3586B, HP3335A, homebrew gps controlled Vectron OCXO, and 80M dipole. Thanks for having these tests. AA0CL MO EM48 Just a K3 and vertical. Good signals all the way to the end, this time, but QRM got intense on 80 from CA. I haven't done this since last September so we'll see what happens. K5CM OK EM25ir Good 40 meters signals from Marvin. Heavy QRN on Marvin's 80 m signal. A HP Z3801 GPS frequency source clocks a HP-3336B. A 10 db transistor amp follows and drives a 12BY7 / pair 6146. Then to the final amplifier, a Dentron 2500 running 300 watts out on 80, 40 meter. There are no mixers or any device in the chain of amplifiers that might impact the accuracy of the GPS frequency source. As a reality check, I periodically log the frequency source against WWV and other GPS referenced sources. I monitor each transmission with a completely separate receive system to look for any instability or short term drift. The separate system is not locked to the GPS transmitting system, but to another GPS source.